I had high hopes for Dayali given the accolades it received from local food critics - #82 on Joanne Kate’s top 100 restaurants of 2013 and the Globe’s 10 best places for Chinese food in Toronto. So, I dutifully rounded up five individuals so a reservation could be made avoiding their notorious wait times (minimum of six people required). Dayali is the Canadian outpost of a popular Beijing based chain. Located in a Markham strip mall, the interior is surprisingly spacious, bright and decorated in a contemporary manner. With soaring ceilings, the surroundings would have been more comfortable if there was better ventilation and the air conditioning was higher. 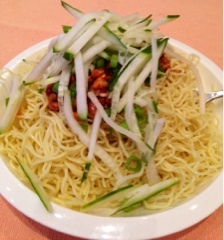 Surprisingly, their service was efficient and pleasant – quite professional compared to most Chinese restaurants. Of course, we couldn’t visit without ordering their star dish… the gold medal roast duck ($38.88); their menu also offers a Peking style roast duck ($31.88). Our waiter explained that the gold medal roast duck is a better quality and “specially selected” and more ingredients accompany it. We were sold and opted for the gold medal version with extra wraps (or on their menu called blinis) ($3.99). The ingredients arrive in a tower with the wrappers held in a warmer in the middle. At the top, a small dish of crispy duck skin perches meant to be a starter and eaten without wrappers. 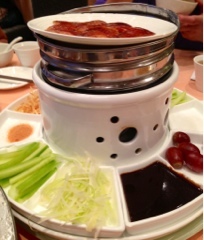 Most people dip it in the sugar, sauce or spicy salt included in the tower; it's an opportunity to just enjoy the duck. Without any meat or fat, this skin only piece is crispy with an oily ting, a good start in warming up the palette for things to come. Afterwards, a second larger dish of duck skin (this time with meat) is brought out for wrapping. 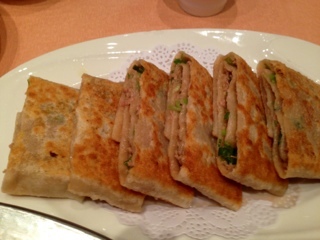 All in all, it wasn’t bad – the duck skin was crispy enough, wrappers nice and thin and loved the different ingredients. Other than the typical green onions, cucumber and hoisin sauce, there were also sweet red grapes and potato chip sticks (think Hickory Sticks without the smoke). My husband and I both enjoyed the addition of potato chips; the grapes on the other hand is an acquired taste. I was disappointed with the duck meat – it lacked flavor, was a tad dry and crumbled apart from the skin when you tried to pick it up. Unless enough hoisin sauce was placed, the wrap would be pretty bland. Dayali’s duck wasn’t the worse I’ve ever had but still, it doesn't deserve the title as best – in my books Chung King Garden Restaurant provides a competitive offering. 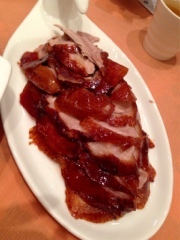 You may find the skin not to be as crispy as other restaurants, this is because Dayali strictly just roasts the duck. Some other restaurants will flash fry the skin prior to serving making it very crunchy. Meanwhile, while most restaurants serve their duck two ways, at Dayali you only have the option of adding $2.88 to make the duck bones into soup. If you opt out, the carcass will arrive in a plastic bag at the end of the meal to go. My husband was excited to see the gold medal sliced boiled fish in chili oil ($19.99) on the menu as he had a great experience with it at another restaurant. I’ll admit the fish has a delicate smooth texture and despite the amount of chili included, if you don’t actually eat the peppers it’s not overly spicy. But, it's harder to get past the fact that it was literally sitting in a pot of oil and had to be drained before eating. Plus, it was really annoying to have to pick out all the small pieces of pepper to avoid the sting. Other items we tried were carb based Shanghai style dishes. My favourite of the night was the pan fried pancakes with stuffing ($7.99). Arriving piping hot with a crunchy crust and chewy dough it was lovely. The “stuffing” is really the same pork mixture used in dumplings, smeared in a thin layer on the pancake, adding a nice juiciness to the roll. 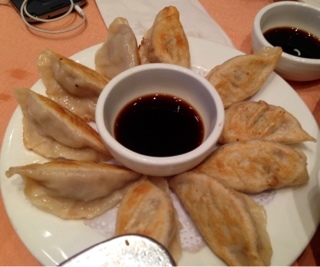 The pot stickers ($6.99) were decent and tasted homemade. They were very similar in flavor to the pan fried pancakes with stuffing, so really you may just want one. The pancakes, in this case, were better given its use of seasoning. Lastly, were the spicy cold mixed noodles ($4.99) consisting of cold chow mein egg noodles topped with a spicy bean & pork mixture and cucumber slivers. This offered a welcomed coolness in the hot restaurant. 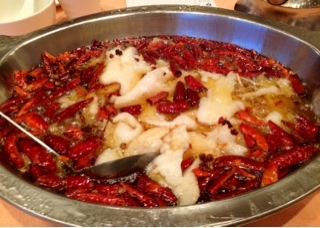 But, as a warning, it’s spicy and I found the dish's entire flavor was masked by the chili oil. Additionally, Dayali should consider serving it in a larger dish given it's difficult to mix up in the small serving plate. The prices listed above are regular menu prices. Diners also have the option to purchase a VIP membership card for $20 providing holders with a reduced price (typically about $2 per dish) and is valid for three years. We opted not to purchase the membership, as although the experience was decent, there are so many other options around Toronto that gives me my duck fix.